Turquoise represents a something between green and blue, this color is unique in its own way, it is bright, fun, and reminds sea moments. In this bedroom is used muted turquoise color that designers were selected specifically for the interior. Turquoise color blends well with the color of the tree and the color of cream, the color looks very rich and amazing. Those who like the white color, it is the best solution in combination with a turquoise color, this interior looks very effective and fresh. Another bedroom with white walls, in which there are shades of turquoise, the color most successful in combination with white, these colors are very nice and gentle, they are pleasant and not contrasting. 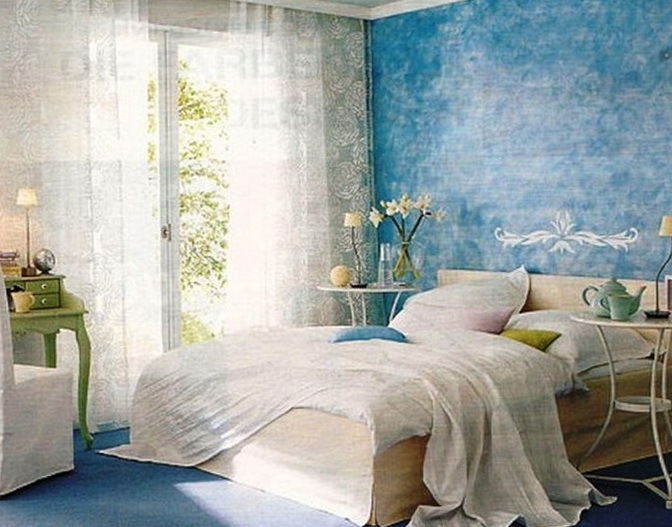 The walls and floor in the bedroom of one color turquoise, and all the furniture is classic white color. Good and very good combination of colors makes the interior and gives it to overload. Attention is drawn wallpaper with a beautiful pattern that is separated in a beautiful frame, which is highlighted with small bulbs with warm light. Some items, lamp, and textiles are also used in shades of turquoise. A bedroom with a choice of colors from pale blue walls, bright turquoise bed and floor in black and white checks, and looks perfectly fine. Beautiful and fluffy carpet milky color blends well with different shades of turquoise, these colors will promote relaxation. In this bedroom using the most common shades of turquoise, this bedroom is well suited as it is for adults and for young children. Bedroom in the attic can be a friendly environment for guests to relax, or small children who like to climb in the attic. Thanks to a small window and daylight, turquoise color enlivens the room.